If you love rock and blues, there’s only one place to be on Saturday 1st December 2018!! 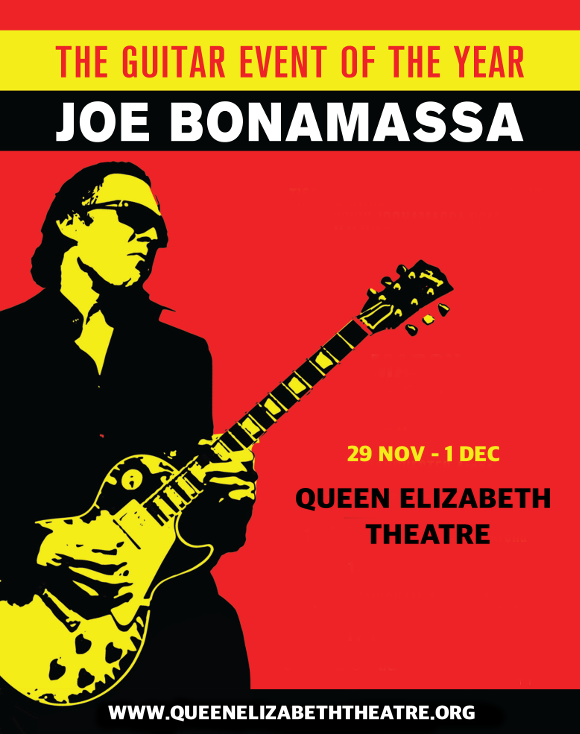 That’s right, legendary guitarist Joe Bonamassa is performing his final show of his 3=night run at the Queen Elizabeth Theatre on December 1st!!! Tickets selling fast for this hugely in-demand show – early booking is highly recommended to guarantee a place at the show!! Beginning to learn guitar age 4, Joe Bonamassa showed himself to be a musical prodigy from an early age. Going on to receive expert tuition from the revered Danny Gatton, by the time he was 12 years old he had his own band and was playing opening sets for acts such as BB King!! Later, he founded the band Bloodline, and began to gain serious attention for his superlative guitar skills. His debut solo album, “A New Day Yesterday" hit the top 1- of the Billboard Blues chart, setting him up for success that would only increase in the years to come. Don’t miss your chance to see one of the greatest guitarists in the world perform live – get your tickets to see Joe Bonamassa TODAY! !